Well, I think it's obvious by now that I've been trying my hand at sewing recently, and have some lovely smelling hearts and stars ready for Christmas but they just need a few finishing touches, so I thought I'd share with you guys a couple of items I totally winged!! I know! One minute I'm fighting with my sewing machine to create a simple star and the next moment I'm creating hanging organisers with no plans! 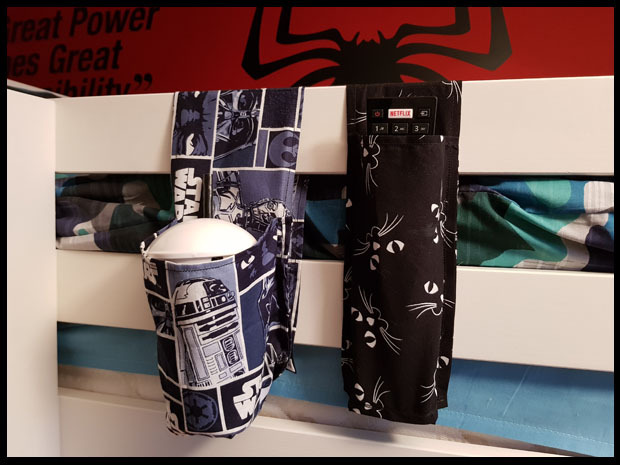 I first made the remote holder, this now saves me trying to route around on a bed that is higher than I am! I end up either on tiptoe or balancing on the toybox and leaning over the bed convinced it's not going to hold my weight! What's more, the cat fabric glows in the dark!! How cool is that. I am nowhere near skilled enough to write a tutorial on either of these I'm afraid. But I will say the remote holder was far easier to make than the cup holder. 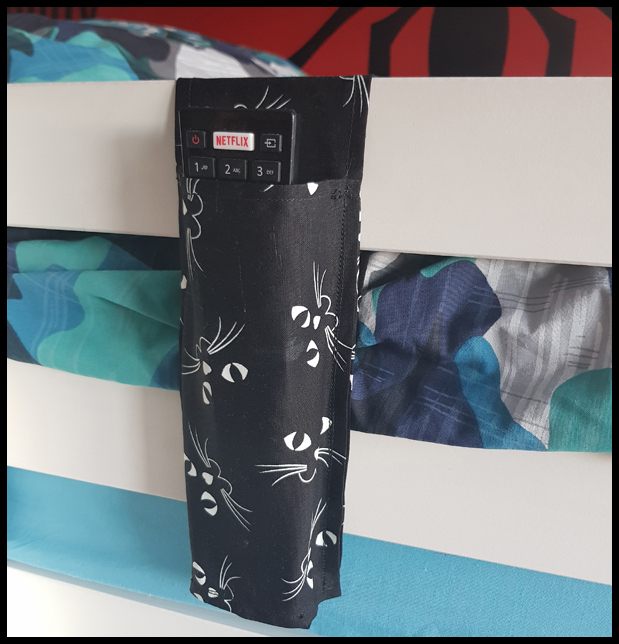 I wanted to create the holders to button up at the back, but I'm yet to learn how to use buttons and buttonholes on the sewing machine so I left that idea out this time as I don't have any more cat fabric to use in case I mess that right up! Instead, I used Velcro and sewing glue. To my surprise, the cup holder is holding up far better than I thought it would. I was concerned as it's larger and holds a more weighty item that the Velcro wouldn't stick, but it does! 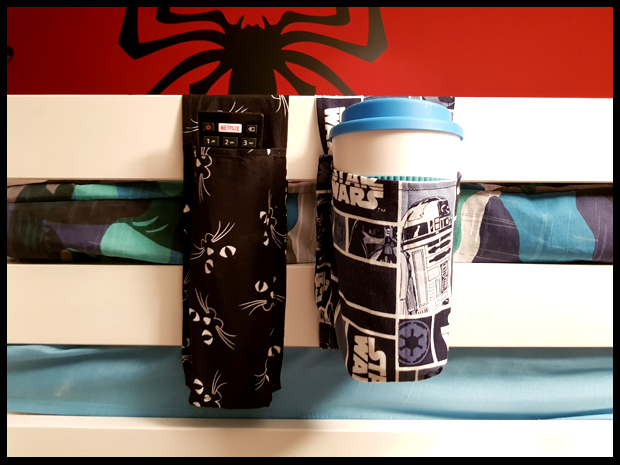 I don't think it hangs well in these photos and then it dawned on me that I can actaully get the back of this holder over two panels of the bunk beds! Which I've now done and the fabric sits far tighter and neater! Forever learning with sewing at the moment! Not perfect by any means, but I had a go! 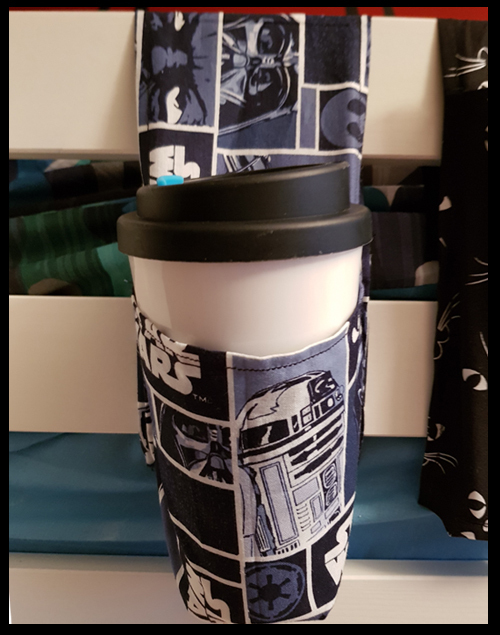 I sat and thought about the patterns and went for it, for that, I'm rather proud of myself.